On Creativity - Steve Gershik says, More success if you start with the YES. Internet Radio and the podcast replays continues to gain an audience in the B2B space as programs and hosts understand the benefits of this multidimensional content creation machine. 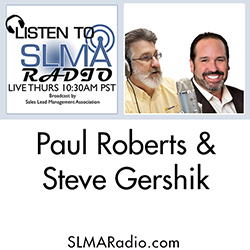 During this program, veteran broadcaster Paul Roberts and Steve Gershik (personality on LeadSpaceRadio) discuss with Jim Obermayer the host, the acceptance of internet radio in the B2B space for at-work listeners. In addition they explore the importance of live steaming for at-work listeners of business programming. Paul Roberts has been a station owner for seven years and also the CEO of West Coast Marketing for 23 years. Roberts created Orange County, California's first Community Radio Station featuring live, weekly broadcasts from OC's top business leaders and community groups. He has since expanded the shows produced to include SLMA Radio, LeadSpace Radio, MSPNow Radio, Contact Radio, SalesPipeline Radio for Funnel Media Radio and several dozen other shows. 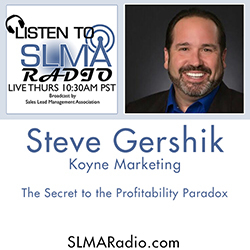 Steve Gershik has 20 years of experience in product marketing, social media, demand generation and brand building, Gershik is an expert in what B2B companies need to do to survive and thrive in competitive environments today. He is an experienced Chief Marketing Officer for early and growth stage technology companies and has been a roll-up-your-sleeves working manager in each of his roles. He's spoken at SXSW Interactive, DMA, AMA, BMA, DemandCon, SiriusDecisions Summit, AdTech, Eloqua Experience. He's consulted for technology startup companies, growth stage firms that need help building a revenue process and publicly traded companies that are looking to build a team of modern marketers. Gershik is a frequent visitor and commentator on SLMA Radio programs.